Maroon 5 took the gig that nobody else wanted, stepping into the role of Super Bowl halftime show headliners in a year where plenty of others turned it down to support Colin Kaepernick and protest the NFL. As expected, Adam Levine and co. delivered a lacklustre string of greatest hits, with very brief cameos from Travis Scott and Big Boi (and SpongeBob SquarePants). 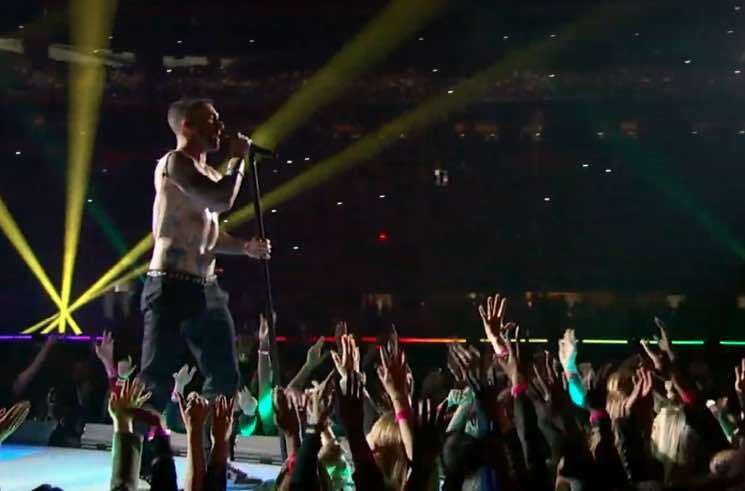 In addition to barely playing the guitar he made a big show of wearing around his neck, Levine also used the stage to perform a layer-by-layer striptease, eventually ripping off his dizzying tank top during "Moves Like Jagger" — a far less subtle move than the one that got Janet Jackson blacklisted in 2004. Others were more offended by the teased intro to SpongeBob's Bubble Bowl rendition of "Sweet Victory" — which abruptly cut out and went into Scott's "Sicko Mode." See some of the less-than-enthusiastic reactions to last night's Super Bowl halftime show. Oh, and in case you turned off the game during Maroon 5's performance, the Patriots beat the Rams 13–3. Hi there while you're enjoying this mediocre Maroon 5 halftime please remember a football legend was blacklisted from this entire sport for merely putting his knee on the ground in protest of black people being murdered. Enjoy your pop music! Relive the controversial performance below.